Our goal is to keep your water sparkling clean, safe, and enjoyable year-round. We know that cleanliness and water quality impact the enjoyment of your pool, and you can count on our prompt, courteous, and highly-trained team of professionals. We specialize in weekly pool maintenance services and can customize a plan for your residential or commercial pool that will suit your needs. We service all in-ground swimming pools. 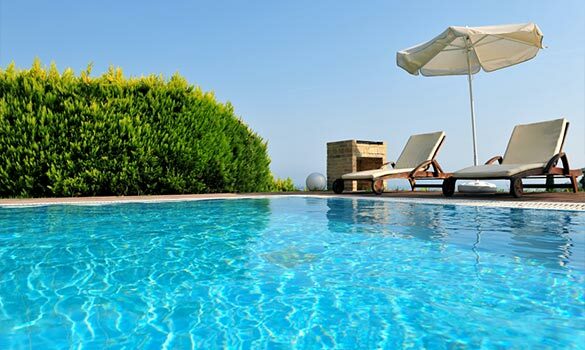 Our weekly pool maintenance services set us apart from other pool companies. Our Pool Service Technicians will come out on a weekly basis to brush and vacuum as needed, test and adjust the water chemistry, empty the pump and skimmer baskets, and backwash and/or clean the cartridges as needed. We test the following parameters weekly: Free Chlorine, PH, and Alkalinity. We also test the following parameters on a quarterly basis: Cyanuric acid, calcium hardness, and salt levels. Our Full Service Program includes full maintenance (cleaning and chemicals) on a weekly basis and starts at $140.00 per month (depending on the size and condition of the pool). We will skim, brush, vacuum (as needed), and empty all baskets to your swimming pool on a weekly basis. Cartridge and DE filters will be cleaned as needed with reassembly and lubrication of filter o-ring. Our Chemical Service Program is the most economical service that we offer and ensures that your pool water will be safe and sanitary so you can swim worry-free. Our trained service technicians test and balance your pool and empty the skimmer basket every week for the low monthly rate of only $65.00 per month. Yes, we provide all the chemicals: chlorine tablets, shock treatments, pH balancers, conditioner, and more! Very professional and quick service.— Anna S.
Serving Hemet & San Jacinto. Specializing in Weekly Pool Service Since 1990.